This book is a lovely place for your mind to rest. Enjoy. Newbery Medalist Cynthia Rylant and two-time Caldecott Honoree Marla Frazee imagine a God living among us in this spirited and moving collection of illustrated poems. What if God was living a human existence? What might God do to pass the time? Write a fan letter? Get a desk job? Make spaghetti? Take a bath? Get a dog? 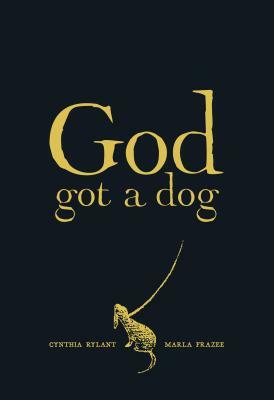 A sublime book for all ages, God Got a Dog celebrates the simple things in our world while taking a long, close look at what it means to be human. The soft, reflective, and often humorous words and pictures create a glimpse into everyday life through wide and wondering eyes that blends the familiar with the profoundly spiritual. These poems were originally published by HarperCollins without illustrations as part of a larger collection entitled God Went to Beauty School ©2003. "Sixteen poems from Rylant’s God Went to Beauty School (2003) return in a new collection, accompanied by new artwork from Frazee, whose graphite-and-gouache illustrations are ideally attuned to the poems’ moments of irreverent humor and poignant reflection. In several images, Frazee portrays God as a child.... Rylant and Frazee’s visions of God as a trucker delivering a fan letter to a country music singer, an ostensibly homeless woman walking through a gorgeous gothic church, and a dadlike fellow in plaid pajamas and slippers sipping coffee under an apple tree combine to form a celebration of God’s humanity and mankind’s divinity." * "An award-winning author and illustrator team up to create a lyrical celebration of where the divine meets the mundane, and ultimately what it means to be human. In this small book of poetry, God decides to “try out” different activities and experiences of humanity, and the results are by turns thought-provoking and inspiring. Each of the 15 poems is coupled with a quietly incandescent illustration that supports the text but doesn’t overwhelm it or diminish its impact. Taken from the author’s longer collection God Went to Beauty School (HarperCollins, 2003), this slimmed down, repackaged version brilliantly captures its sweetness and substance but provides a simpler progression and arc. Selections alternate pronouns for the deity, with God referred to as He or She in each poem.... While this title might be controversial...it will appeal to a wide audience of both children and adults. This is one book that’s easy to pick up, but hard to put down again." * "Oh, God. As this book so intriguingly suggests, You do come in many shapes and sizes. Colors, too. But more than what the deity looks like, this slim volume of 15 poems focuses on what God does.... The messages aren’t always immediately clear, but that’s what makes this so much fun. Seeing God in new ways allows children to think about their relationship to Him or Her differently. In this interpretation, God and humans are co-creators of an evolving world. Though the poetry has been published before in a collection, the artwork is all new. Frazee’s pictures, each facing a page of text, are a powerful contrast of light and darkness, restlessness and contentment. God didn’t think she had time for a dog. But she got one anyway." "By imagining God’s experiences with such earthly undertakings as making spaghetti, catching a cold, working a desk job, writing a fan letter, and yes, adopting a stray dog, Cynthia Rylant and Marla Frazee have created a lovely and accessible collection of illustrated free-verse poems exploring God’s love and humanity...a beautiful collection which celebrates life and approaches the idea of God with sincerity and respect...very highly recommended."